Yes, ABC soup CD (cover)! Ta-daa! Received this from SK before lunch time. Fuiyoh, got medal somemore! When I opened the parcel, I was only expecting my CD. 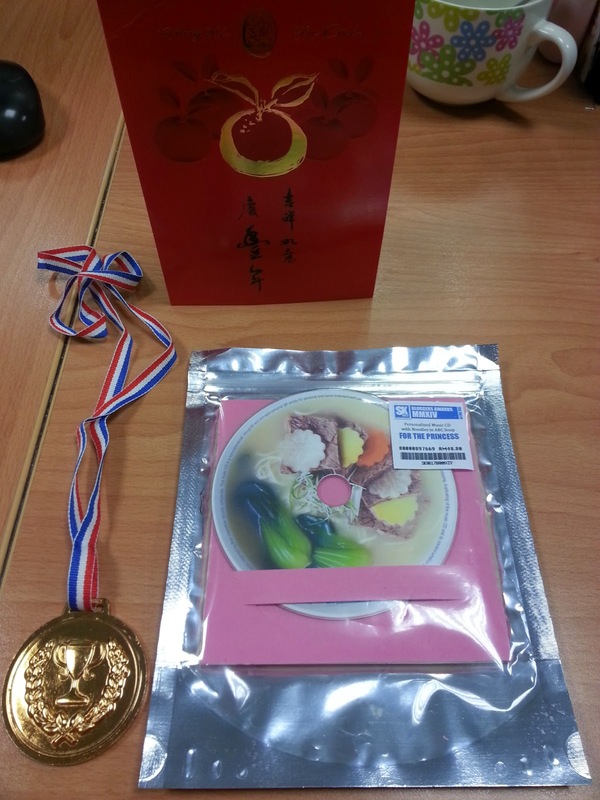 But there were also a CNY card and a medal! I was like, wow. Look at the packaging, it looks like "heong peang" packaging, or chicken biscuits packaging. Wait, I think it looks more like "yok kon" packaging. Cute hor? And look at SK's thoughtfulness! 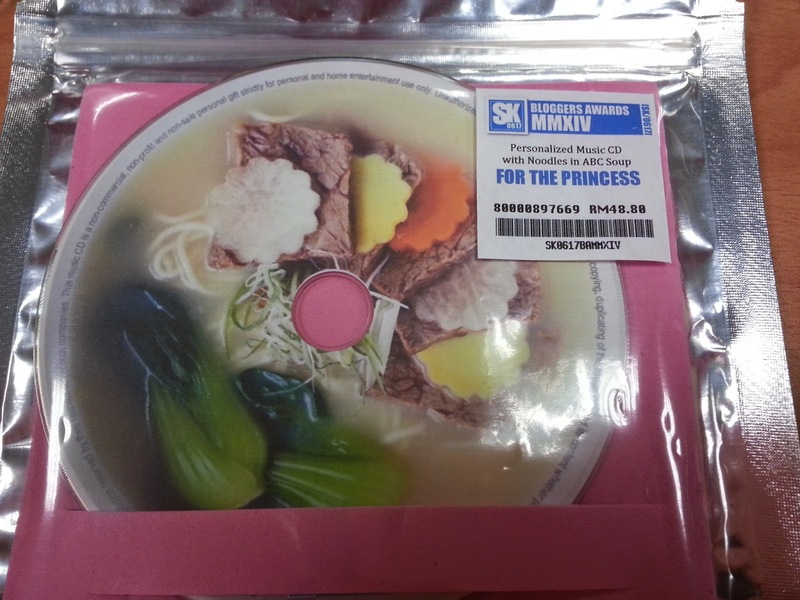 Personalized music CD with noodles in ABC soup cover leh! Coz my trademark is always ABC soup. OMG, what should I say now? Fuiyoh, I was so efficient ahh? I take that as a compliment.. Errr, of course I have work ler, but I still have some time to selfie selfie chik chik chak chak and post geh, not that long also what..
hope you like this slightly "playful" theme for this year's CD lah.. last year subtle and minimalist, some complained it's too dull, so this year make a total change and go playful with colors, and of course food!! i try to associate each blogger with a type of food lah, and of course Princess Ribbon = ABC soup lah.. and if only you can make your ABC soup like that, see the carrot, potato and onions?? got flowers one, so nice, hahaha!! Ya wor, don't say them la, I also sum-si-si wana see what others get on their CD cover leh.. I hope they blog about it so that I know also..
Fuiyoh, got surprises somemore wor inside! This one, I admit I not yet open my "heong peang" packaging, mm seh tak open ma.. I slowly open tonight.. Thank you sweetie, hehe... The CD cover so nice leh..
wah so thoughtful of SK, can customized the CD cover lagi..
nway, it really brighten up the day to receive a CNY card, so long i never get a proper CNY card liao. Ya wor, SK very the thoughful.. I was laughing when I see ABC soup cover, haha, coz I'm always about ABC soup only..
Hi hi sweetie.. So what's yours on your CD? I believe must be cake or roast chicken? 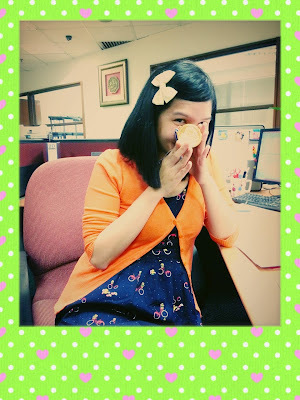 Yeah, I purposely make this malu-malu kuching pose, don't want to let you guys see so much ma, hehe.. Thank you, now I'm thinking of noodles with ABC soup, haha..
Haha, I'm laughing at the word ABC soup princess.. I think next time can change name to abc soup princess ribbon, haha..
Oh, you are so cute in the photo! :D Wah, this SK, write on the CD, For the Princess, somemore. Better keep it properly else your husband may be jealous when he sees the CD. I left the CD in the car and already listened to the whole CD while driving back from work yesterday.. I like ABC soup from young til now.. nice soup anytime any day anywhere..
Looks like he has a theme for each winner, I haven't collected mine, it's at my mum's place. Yeah the cover looks really unique.. If ppl dunno ingatkan they are cooking DVD timmmm..
Wah. Nice lah. A great personalised gift. He is very thoughtful. He should have given me a Gold Medal every year for being the most loyal fan for years. Happy weekend and happy listening to his songs! I'm listening this morning again coz I put in my car.. So far, I think I have 2 of his CD's already, yay! I am back to admire your ABC soup and I think yours is really 3-D to look so real. Why don't you put the CD on a soup bowl with fork & spoon beside? Snap photo! Voila! Wow..Congratulations! Yummy cd cover. So nice of SK. Yep, very yummy indeed, now I don't mind having ABC soup with noodles anymore, haha..
Wah, you mentioned CKT only, I'm hungry pulak, thinking of CKT now.. Haha..
1) SK is so creativity. Love his humor... SK, If you are reading my comment, I have to say that you are really a funny guy!!! Very nice of you to puji SK, if he is reading this, he will be very happy, teehee..
Wah.. You got medal some more ! Hahaha .. You always boiled abc soup ? Haha, yeah wor, got medal.. SK said the top 3 got medal, fuiyoh..
You so cute la!! I like the last picture! You really efficient, guess you're the first one who post this!! I do agree it looks like "yok kon" hehe!! Have the same thought when I opened it as well!! Yeah, that day I received before lunch time, then I went out for lunch, came back terus post lor.. Hehe, yeah, got something new to write about ma.. Everyday talk about kids also sien ma..
Wow! What a nice and thoughtful present! You must be over the moon! LOL! Haha, guess all the CD winners also felt the same.. Each CD with different food.. Yummy, haha..
Really a priceless gift!! You deserve it Louiz! 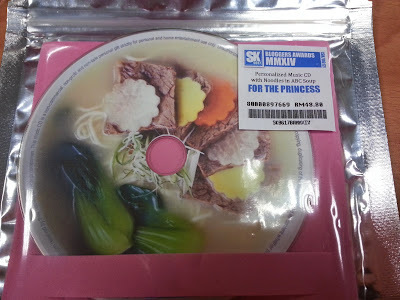 Hehe, all the winners deserve them, they spent so long time spamming each of SK's post wor, hehe..
ABC soup CD, lol! The ABC soup looks so good on the CD. SK is always lovable, hahaha! Yeah abc soup looks good.. Now I wana drink abc soup everyday, haha..
Hello Emily nice to see you here.. Oh yes I always boil abc soup, then keep the leftovers for maximum of 3 days.. Good to cook noodles or macaroni or meesua for the kids..